Enjoy the trip. It's gonna be strange, shocking and kind of creepy! The dog. The family member with abundant hair. We love them and are use to them in our daily lives. We recognize them no matter what breed of dog they are as just that, dogs (well, Rocco, my brother and sister-in-laws Chinese Crested may be the exception). So, what are some other creatures that lurk about this world we may not be use to or may not recognize? Let's go find out; I am going to take you on an animal adventure where you will meet critters you have never seen before and will hardly believe are earthly beings at all. Enjoy the trip, it's gonna be strange, shocking and kind of creepy! We will start off slow with this White Uakari. 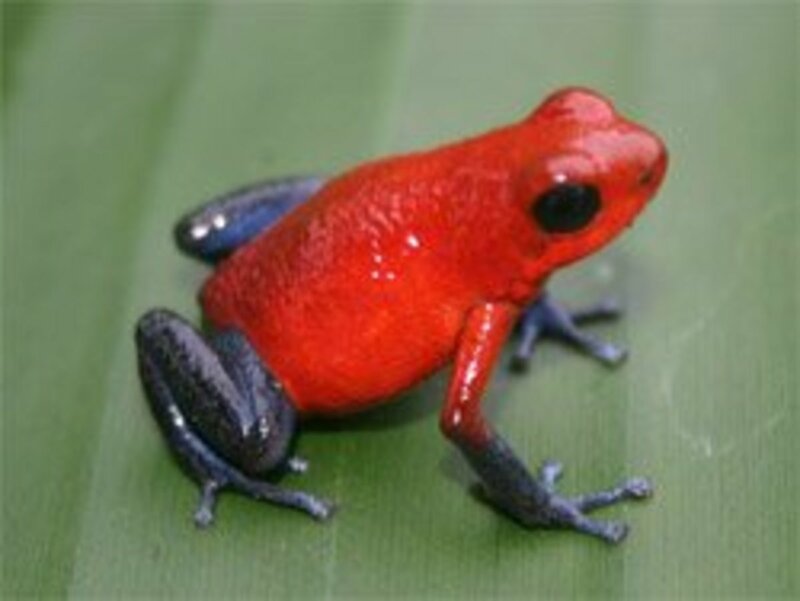 As one of the more striking animals on earth, it has a bright red face with an uncanny human like features, noticed mostly when considering the ear configuration. This weird critter is known as 'Englishman' by the local population where it lives. In spite of their bright red assertive appearance, the Uakari are a passive and quiet animal. They are found in a small river-bound community in north-eastern Brazil, in the forest called the Várzea, where it floods seasonally. 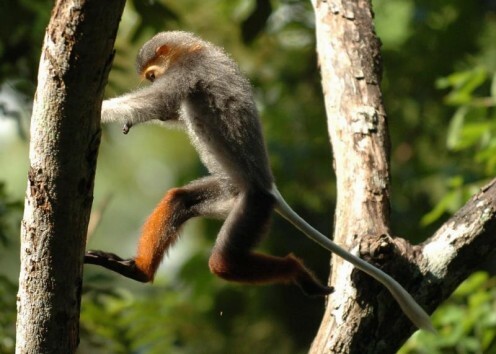 More odd, these short-tailed monkeys cannot swim, while they traverse the banks of larger rivers, it rarely leaps, possibly for fear of falling to a watery grave. Preferring to walk through the canopy in search of fruit, insects and of course, Brazil nuts. The jaw and tooth power of these quiet creatures is evident as they crack open the Brazil nuts with their teeth. Don't try this at home! Now that's a ride baby! While strolling the rainforest's in south-eastern Asia, (and you know you do) you may want to look overhead. 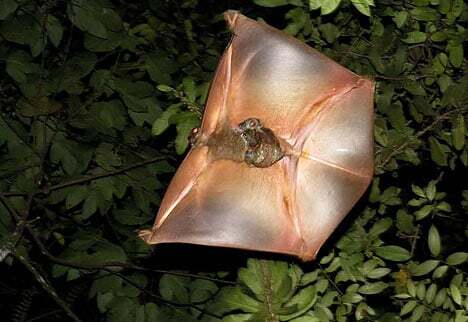 The Colugo, the most accomplished of the volplaners—to glide without motoritation—glides from tree-branch to tree-branch in search of leaves, buds and fruit. Relics from a far ago time, 50 million years ago their relatives could be found as far north as Canada. This volplaner master has a volplaning membrane which stretches from its neck to the tip of its tail and on to its feet. 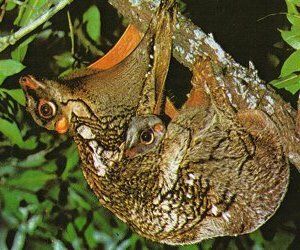 If you think you play extreme sports, these daredevils can accurately glide about 427 feet (130 meters) through the crowded canopy while only dropping around 30 feet (10 meters) in elevation; not so bad considering these heavy weights measure in around 3½ pounds (1½ kilograms). The babies hang out in the armpit area where two teats are located under the blanket-like gliding membrane. Now that's a ride baby! Nope, it's not a flattened sea urchin, it's a Starry Batfish. This odd looking fish can walk on its four limb-like fins, and can also propell through the water using gill-slits located on the sides of its body. Adults have been measured up to 12 inches (30 centimeters) in length and their exterior body is as hard as a rock. The design of the skin offers interlocking bone plates which provide effective protection against predators. 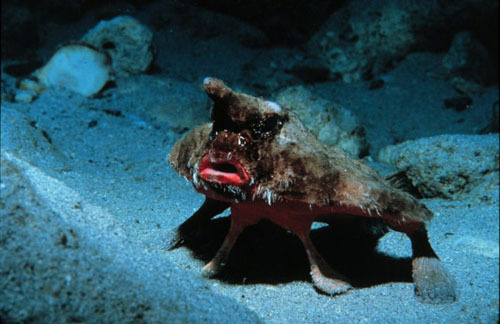 The first Starry Batfish discovered back in 1902, measured a little shy of 2 inches (5 centimeters) and was brought up from an amazing depth of 438 yards (400 meters) near the Hawaiian islands. They are capable of swimming in an ordinary fishy manner, but are more apt to casually stroll along the ocean floor. Not much more is known about these crazy icthiode's, however the question's continue to flourish. 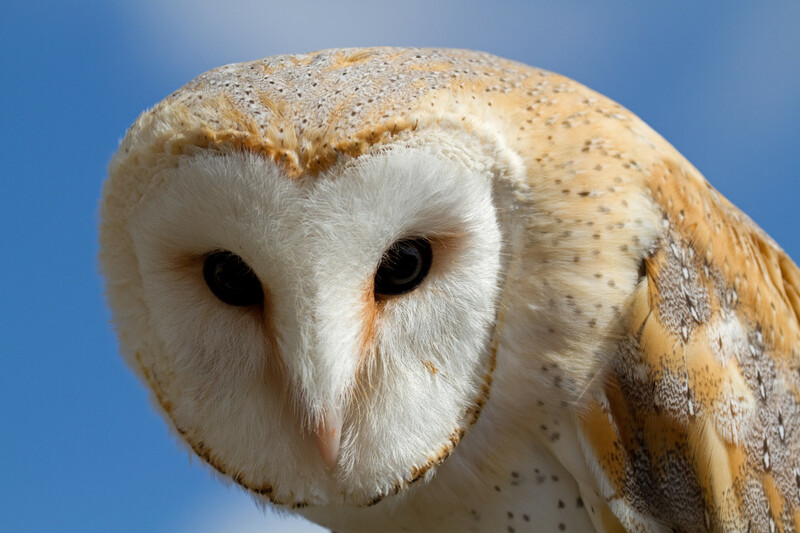 Would you consider owning an exotic animal? Sure. As long as I had the right habitat for it. No. Those exotic creatures belong in the wild! Maybe. It would depend just how exotic the animal is. Their beauty would seem to be their best as well as their worst quality. 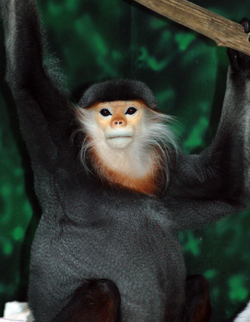 The Laos and Vietnam tropical rainforests provide the home base for this leaf monkey. 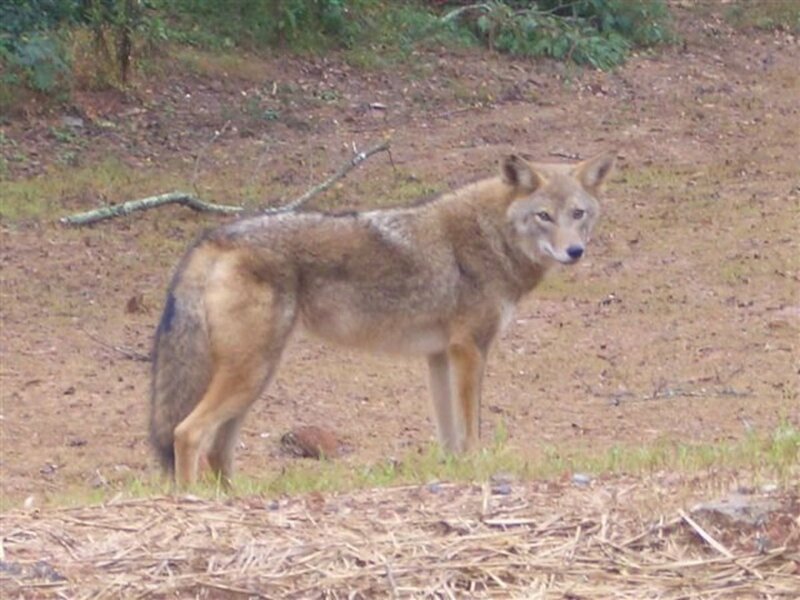 The Douc is quiet and gentle being hunted by humans for food and for target practice. During the Vietnam war, the U.S. dropped defoliants like Agent Orange over the homes of the Douc. This has caused a measured decline in the reproductive rate for the monkey. The Douc sends out a twittering sound similar to a bird call to beckon its social group. When left to simply reside, these handsome animals habitate in groups of four to fifteen. A single male leads the troupe on cautious treetop quests in search of food consisting of leaves and fruit. When humans see these rare creatures, they are often killed for pelts or food. Their beauty would seem to be their best as well as their worst quality. Lucky for the mother Pangolin, the baby's scales don't harden until the second day of living! Extremely sharp, flat hairs that resemble fingernails or fish scales cover this odd creations body. 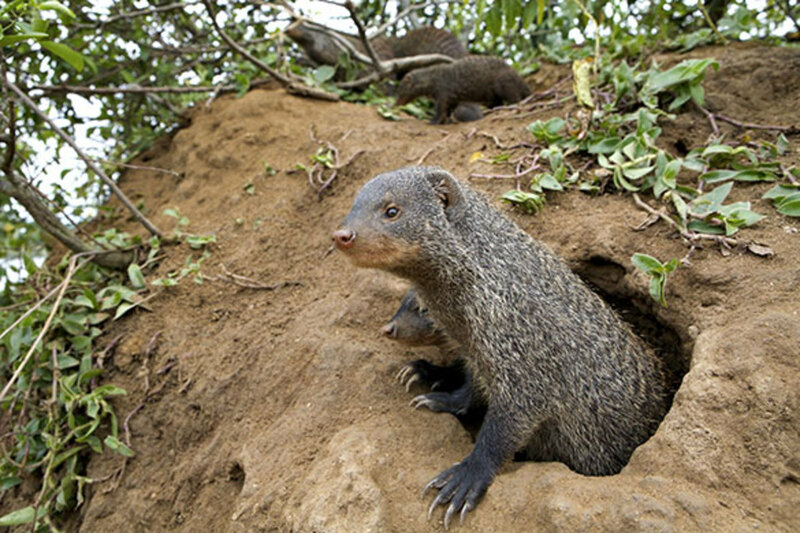 They are ant and termite eaters, yet so unlike the silky soft anteater we are accustomed to seeing. 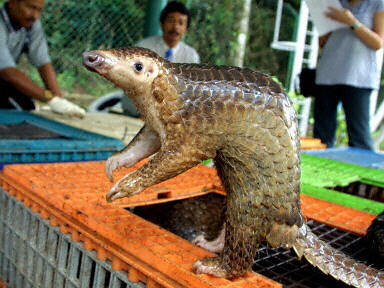 A biological mystery for sure, the Pangolin are more closely related to the dog or cat than the anteater or armadillos. Because they don't need sharp teeth or complex bone structure to acquire food, the species has developed the simplest skulls of any animal. No longer having teeth, its food is captured by using its hugely long and sticky tongue and then crushed by tiny stones it swallows and stores in its stomach. 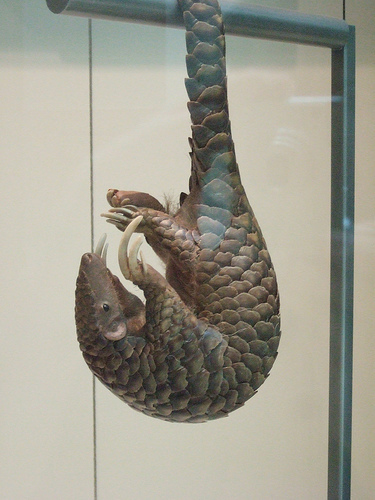 The strong back muscles allow the Pangolin to curl up in a tight, inaccessible ball when threatened. It can be found in trees from Senegal to Uganda and Angola. Lucky for the mother Pangolin, the baby's scales don't harden until the second day of living! 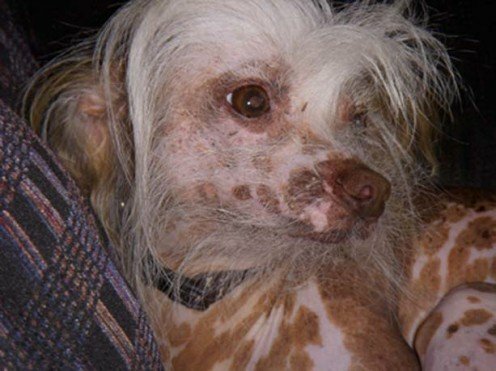 Comments for "Some Pretty Weird Animals, Including the Pangolin and Uakari"
I also have a hairy, hairless Chinese Crested. She is absolutely lovely as is your sisters furbaby! Maybe not for this list, but that is just my opinion. kruby~ Thanks for the comments,...I think. The weird animals you mention do seem far more absurd than those written about here. Possibly another weird animal hub to consider in my future. Thanks Cags~So pleased you made it by. Great job on your racism hub, I was well impressed!The Coluga is an amazing little thing, its wings (membrane)looks so very weird! I wonder if the babies get frequent flyer miles? Maximum A~Thank you for the comment. I am thrilled that these odd wonders exist as well! It gets harder to take my eyes off of them even as I look at them frequently. nice! i like the animals. they're so cute and amazing especially the white uakari. always good to know such wonders still exist. BenjaminB~LOL! I am with you, not one of these guys would be welcome snuggled up on the couch! Thank you for the comment, and for stopping by! I think I'll stick with the dog,lol,but a great showcase here! I really appreciate your comments, I am honored when you read my work. kaltopsyd~HI K, glad you could make it by! I really had a good time with this hub. I am going to be doing a similar hub, but with different critters very soon. I am always honored that you read my work. chardee42~Thank you for the comment. The vast amount of creation within the animal kingdom is truly inspiring. I appreciate the read. You've included some beautiful photos. Its great to learn about animals that we may otherwise never get a chance to see. You chose the coolest animals to feature in his Hub. I don't think I'm familiar with any of them. Some are odd lookin but others are pretty cute. Thanks for an interesting Hub. Wendy Krick~ Thank you for the comments, I am grateful for the read! Wow! 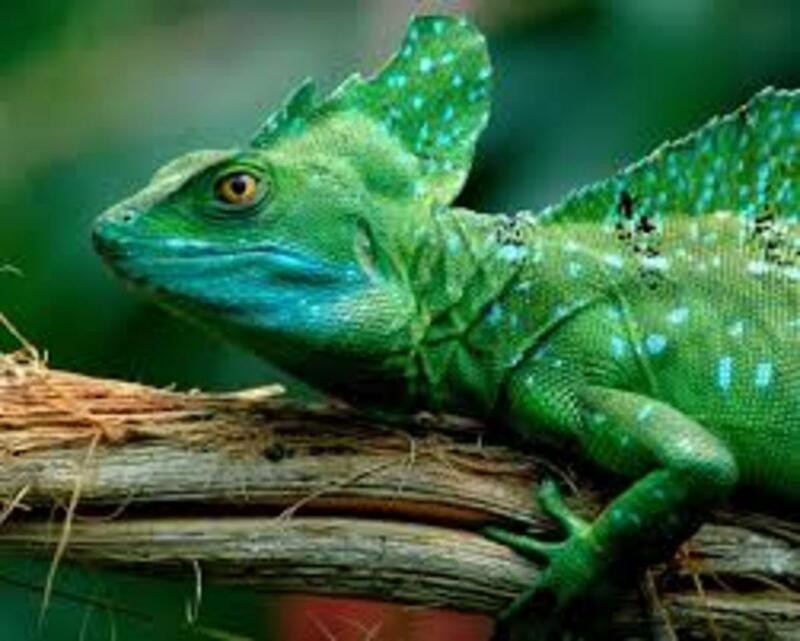 These are really neat animals. billyaustindillon~Thanks a million for the read! I was not familiar with the Pangolin until i visited a reserve. I was instantly captivated. Appreciated you stopping by. Amazing selection - only one I had heard of is a Pangolin and that is out of one of more boys childrens books lol Great hub and presentation. LeanMan~I recently found an interest in exotics, and the Pangolin was one I thought was among the most exotic. These sleek, strong armour plated creatures are spectacular in their attitude as well as uniqueness. I appreciate the comment! I have always been fascinated by the Pangolin, never thought I would see one here on hubpages. Do any of these claim you as their owner? I have only a humble lab mix dog. Pam~ I found them fasinating creatures to be sure! I am always happy to see you have found time in your day to read my work. Thank you for the comment, greatly thankful. Smart Rookie~Of all of the odd creatures I ran across, it was these few that made the animal cut. It was amazing just how many there is to choose from. Thank you for the comments, very glad you stopped by. Wow, those are some odd creatures. Very interesting presentation, K9. cosette~Honored as always that you stop by. Thanks for the read. I found this red faced guy to be so human-like and his ears were so closely design as our human ears,...almost too creepy! Our world, you are right, it is an amazing place on so many levels. Jane@CM~I can't say snuggling would be first on my list of things to do with these creatures either! Thank you for the read. Mutiny92~Amazing they are, and I was excited to do the research because of they are! I appreciate your comments and you stopping by. i have never heard of any of these creatures. what an amazing planet we live on. that White Uakari looks so human, wow! rating UP. 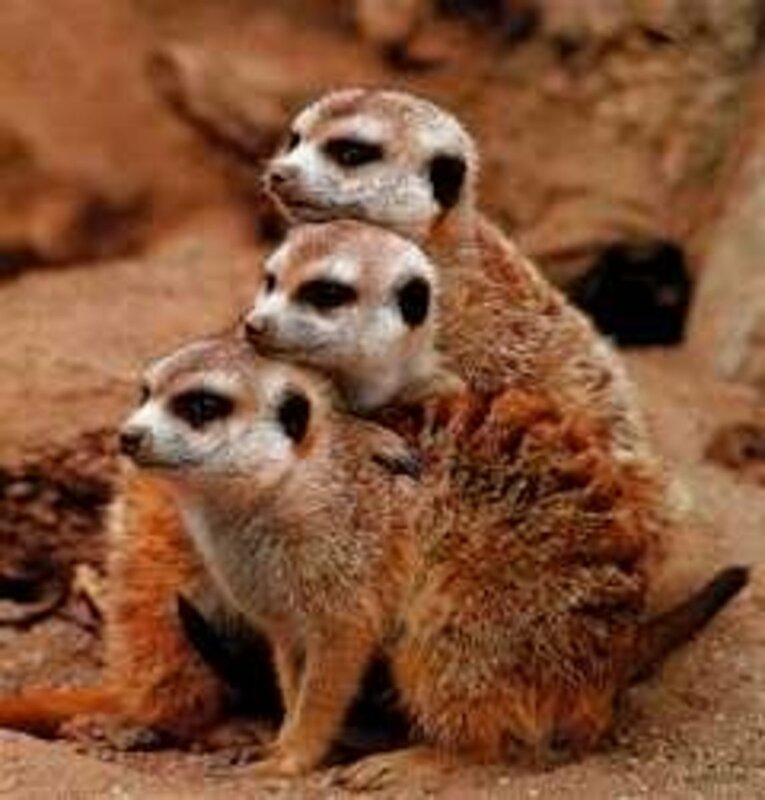 What an unusual array of unusual animals, just when you think you have seen it all. This is a very interesting hub. those are some amazing creatures. I had never heard of some of them. Thanks for the information! rgarnett~LOL! Yea, he is the cuttest in the bunch, blinding and all. Thank you for the read! Always grateful. Wow, these are some creepy looking animals. I do like the red faced monkey. He's kinda cute, though he would blind me. Very bright!